I scoured the web to find another hosting plan. There are so many different web hosting services at vastly different price points. I didn’t know which one to pick so I went on Reddit to ask for advice. One person recommended BuyShared for website with little traffic. I went and check it out. To my surprise, the cheapest plan is only $5 per year. I was blown away by that price. On top of that, they also offered free SSL using Let’s Encrypt. Naturally, I purchased it right away and used it for my business website. The set up was a breeze since I already had a backup of my site in WordPress. Setting up the SSL was just one click. The only thing that took time was waiting for my DNS to propagate from NameCheap to the nameservers of BuyShared. After 24 hours, my business site was up and running on the new host. Once that was done, I went on to find a place to host my blog. I knew I wouldn’t use WordPress for it so the only logical choice was a static website. And if it’s a static website, the best place for it would be Github Pages. The default theme for a new Jekyll site is Minima. Of course you can always change it to something else. Github supported a bunch of different themes. At first I thought I would need to also learn Ruby to modify my site but Jekyll uses Liquid templating language, which looks just like Jinja2 for Flask. Since I already knew Jinja2, that made it very simple for me to bring all my posts and code snippets over. 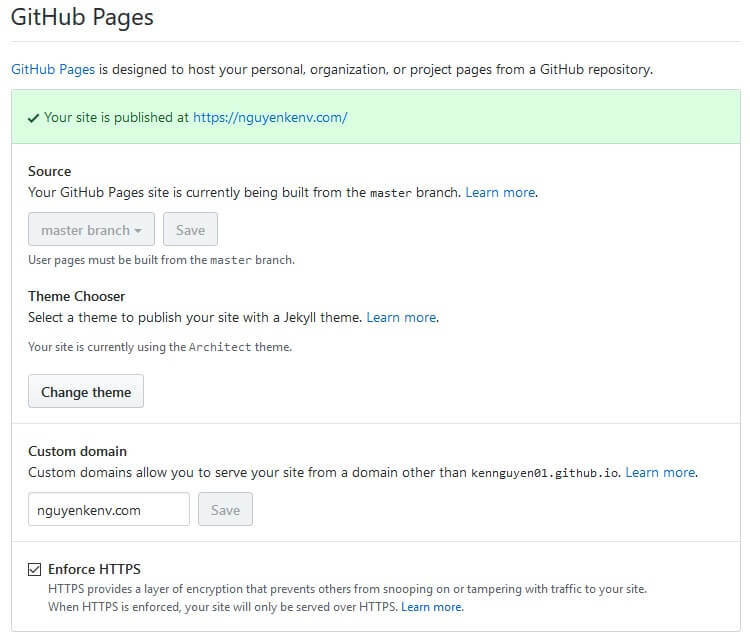 Github supports custom domain name, you just go to the Settings of the repo and scroll down to where it says GitHub Pages. I changed the custom domain to my own domain name. That automatically created a CNAME file in my repo. But the domain name still doesn’t point to Github yet. To do that, I need to configure the A records with my NameCheap domain. A free SSL certificate is also provided by Github. I had to wait for some time while the certificate is being issued. After that’s done, I just click on Enforce HTTPS. Finally, my static blog is hosted on Github for free. There’s a bit of work involved with setting it up but it was a good learning experience for me. The blog is still a work in progress since I need to figure out how to enable pagination. My blog currently display all my posts on one page but that’s something I can work on later. I also saved a lot of space with this. The WordPress backup I had for the old blog was 98.6MB while the size of the new repo is only 1.1 MB. And the images actually took up 941KB of the total space. Once I use an image hosting service like imgur to host all my images, the total size of my current blog would only be 159KB. I literally just saved 99.8% of the used space by switching over to a static blog. Overall, I’m very happy with the new blog.